On the occasion of International Women’s Day, which falls on March 8, the sisters tell The Indian Express how important it is to remain positive through the many curveballs of life. Poornima Iyengar and Gayatri Bhat. 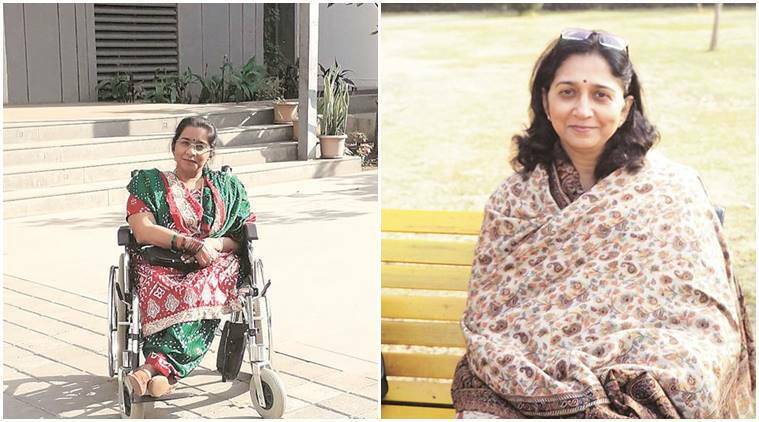 They faced multiple challenges, including several diseases and disabilities, but sisters Poornima Iyengar (48) and Dr Gayatri Bhat (52) have not only taken these challenges head-on, they have emerged on the other side as winners in their own right. Poornima was afflicted with polio when she was two years old, and Gayatri has fought a rare form of cancer, and a host of other diseases. On the occasion of International Women’s Day, which falls on March 8, they tell The Indian Express how important it is to remain positive through the many curveballs of life. “Build on what one is passionate about… many doors will open,” says Poornima, a single mother who is encouraging her son to be a professional tennis player. Paralysed waist down, the wheelchair-bound Poornima admits that most of the challenges she faces are physical obstacles. “When it comes to facilities for the differently-abled, we are still years behind western countries,” she says. A linguist, she has been translating works in German and French for over 20 years. Poornima says her parents, who never treated her differently than her siblings, helped her cope with her disability. “Like others, I had to follow the rules of the house. I was never stopped from trying to do anything. That is something that every parent with a differently-abled child must do… encourage… not overprotect the child to make him/her even more handicapped than he/she actually is,” she adds. Gayatri, a paediatrican, says her younger sister’s independence and resilience was a source of inspiration for her. Gayatri moved to Delhi after her marriage and had two children. “I didn’t realise my life was to going to change forever… but after the initial shock of being diagnosed with multiple myeloma — a rare form of blood cancer that theoretically has no cure — I decided to accept the situation and learn to deal with it,” she says. While a series of doctors from hospitals across Mumbai, Delhi and Vellore helped and guided her during the traumatic phase, Gayatri faced some stiff challenges between 2001 and 2009, when she underwent a series of chemotherapy sessions and a bone marrow transplant to reduce the tumour burden. “I felt sick and didn’t even have the strength to talk. There was a series of diagnosis dilemmas and long periods of immobility… then my father was diagnosed with stage 4 lung cancer… it has been a long and tedious journey,” she adds. Gayatri also had to deal with scleroderma, an auto-immune condition in which muscles and fibrous tissue lose elasticity. She also suffered an adverse reaction to a drug used during chemotherapy, dealt with complications like osteomyelitis, and had to undergo several surgeries to save her leg from being amputated. “I had peripheral neuropathy and initial stages of interstitial lung disease. But miraculously, I went into remission and have stayed so till date,” she says. Gayatri is actively engaged with Yoddha, a support group for patients who need counselling. “The work is voluntary and it is my way of giving back to the society,” she says. For both Gayatri and Poornima, it is their positive outlook that has helped them cope with the many challenges life has hurled their way. For Poornima, an experience at a treatment camp in Bengaluru changed her perspective towards life. “I was in Class 8… at the camp, I saw several people who were like me or were in a worse situation. I stopped feeling like a victim… My focus improved in every field and that helped me chalk out my path to reach where I am today. Women have tremendous strength. I would say ‘look beyond your current situation and draw strength from within’,” she says.